Trinity College, Dublin (TCD) (Coláiste na Tríonóide in Irish), corporately designated as the Provost, Fellows and Scholars of the College of the Holy and Undivided Trinity of Queen Elizabeth near Dublin, was founded in 1592 by Queen Elizabeth I as the "mother of a university", and is the only constituent college of the University of Dublin. 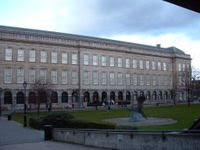 Trinity and the University of Dublin form Ireland's oldest and most prestigious university. Trinity is located in the centre of Dublin, Ireland, on College Green opposite the former Irish Houses of Parliament (now a branch of the Bank of Ireland). The campus occupies 190,000m² (47 acres), with many buildings, both old and new, ranged around large courts (known as "squares") and two playing fields. 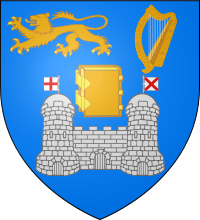 The first university of Dublin was created by the Pope in 1311, and had a Chancellor, lecturers and students (granted protection by the Crown) over many years, before coming to an end at the Reformation. 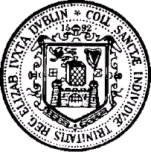 Following this, and some debate about a new University at St. Patrick's Cathedral, in 1592 a small group of Dublin citizens obtained a charter by way of Letters Patent from Queen Elizabeth incorporating Trinity College Dublin at the former site of All Hallows monastery, to the south east of the city walls, provided by the Corporation of Dublin. The first Provost of the College was the Archbishop of Dublin, Adam Loftus, and he was provided with two initial Fellows, James Hamilton and James Fullerton. Two years after foundation, a few Fellows and students began to work in the new College, which then lay around one small square. During the following fifty years the community increased and endowments, including considerable landed estates, were secured, new fellowships were founded, the books which formed the foundation of the great library were acquired, a curriculum was devised and statutes were framed. The founding Letters Patent were amended by succeeding monarchs on a number of occasions, such as by James I (1613) and most notably by Charles I (who established the Board - then the Provost and seven senior Fellows - and reduced the panel of Visitors in size) and supplemented as late as the reign of Queen Victoria (and later still amended by the Oireachtas in 2000). The eighteenth century was for the most part peaceful in Ireland, and Trinity shared in this calm, though at the beginning of the period a few Jacobites and at its end some political radicals perturbed the College authorities. During this century Trinity was seen as the university of the Protestant Ascendancy. Parliament, meeting on the other side of College Green, made generous grants for building. The first building of this period was the Old Library building, begun in 1712, followed by the Printing House and the Dining Hall. During the second half of the century Parliament Square slowly emerged. The great building drive was completed in the early nineteenth century by Botany Bay, the square which derives its name in part from the herb garden it once contained (and which was succeeded by Trinity's own Botanic Gardens). The nineteenth century was also marked by important developments in the professional schools. The Law School was reorganised after the middle of the century. Medical teaching had been given in the College since 1711, but it was only after the establishment of the school on a firm basis by legislation in 1800, and under the inspiration of one Macartney, that it was in a position to play its full part, with such teachers as Graves and Stokes, in the great age of Dublin medicine. The Engineering School was established in 1842 and was one of the first of its kind in the British Isles. 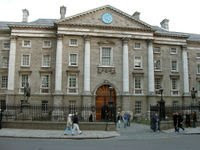 In December 1845 Denis Caulfield Heron was the subject of a hearing at Trinity College, Dublin. Heron had previously been examined and, on merit, declared a scholar of the college but had not been allowed to take up his place due to his Catholic religion. Heron appealed to the Courts which issued a writ of mandamus requiring the case to be adjudicated by the Archbishop of Dublin and the Primate of Ireland. The decision of Richard Whately and John George de la Poer Beresford was that Heron would remain excluded from Scholarship. 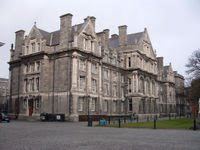 Trinity is one of the seven ancient universities in the English speaking world and the only one outside the present United Kingdom, and is perhaps the most prestigous third level institution in Ireland. The institution is regularly ranked highest in Ireland on metrics as provided by certain global (but not comprehensive) surveys. The Trinity academic year is divided into three terms in the same manner as the University of Oxford — Michaelmas term (October, November and December), Hilary term (January, February, March) and Trinity term (March, April, May). First year students are called Junior Freshmen; second years, Senior Freshmen; third years, Junior Sophisters and fourth years, Senior Sophisters. Trinity College is recognised internationally as Ireland’s premier university and is the only Irish university to rank in the top 100 world universities (53rd) and amongst the top 50 European universities (13th) by the Times Higher Education Supplement (THES) university league tables. Our three faculties are Arts, Humanities and Social Sciences; Engineering, Mathematics and Science; and Health Sciences. There is in excess of 200,000 m2 of buildings, including beautiful historic architecture and state-of-the-art modern facilities. Over 90 College societies and 50 active TCD Sports Clubs exist . Every year some 250 students leave College to study abroad. Students at the undergraduate level are usually eligible for an honours Bachelor of Arts degree after four years, but in exceptional cases, or in some professional subjects such as medicine, may receive an ordinary BA after three years' study. Bachelors who have held their degrees for at least three years may pay a nominal fee (of €543 in 2007) to have the Master in Arts degree conferred on them, as at Oxbridge. The four-year degree is closer to the Scottish model than the English, and some describe it as unusual among Irish universities, some of whom award Bachelor of Arts after three years of study, though most bachelor degrees such as business, engineering and science take four, and some, such as dental science or medicine usually take longer. In recent years, students have been offered a limited range of courses outside of their major field of study under a 'broad curriculum' policy. The Law School awards the LL.B., the LL.B. (ling. franc.) and the LL.B. (ling. germ.). Other degrees include the BAI (engineering), B.Sc. (Pharm) (pharmacy) and BBS (business studies). The BSc degree is not in wide use; most science and computer science students are awarded a BA. In addition to academic degrees, the college offers Postgraduate Diploma (non-degree) qualifications. The Library of Trinity College is the largest research library in Ireland. As a result of its historic standing, Trinity is a legal deposit library (as per Legal Deposit Libraries Act 2003) for the United Kingdom of Great Britain and Northern Ireland, and has a similar standing in Irish law. The college is therefore legally entitled to a copy of every book published in Great Britain and Ireland and consequently receives over 100,000 new items every year. The library contains 4.5 million books, including 30,000 current serials and significant collections of manuscripts, maps, and printed music. Six library facilities are available for general student use. The €27 million James Ussher Library, opened officially by the President of Ireland in April 2003, is the newest addition to Trinity's library facilities. The eight story 9,500 m² building provides 750 new reader spaces and houses the Glucksman Map Library and Conservation Department. The Glucksman library contains half a million printed maps, the largest collection of cartographic materials in Ireland. This includes the first Ordance Surveys of Ireland, conducted in the early 19th century. The Book of Kells is by far the Library's most famous book and is located in the Old Library, along with the Book of Durrow, the Book of Howth and other ancient texts. Also incorporating the Long Room, the Old Library is one of Ireland's biggest tourist attractions, and holds thousands of rare, and in many cases very early, volumes. 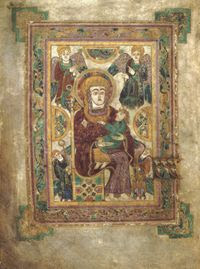 Though the Book of Kells has been exhibited in other locations, damage caused on a loan in 2000 to an Australian institution has led to a policy of never allowing the book to leave Trinity again. So Precious: "The Book of Kells"
The look of the Great Jedi library (the Library of Ossus) in Star Wars Episode II: Attack of the Clones was inspired by the Long Room; the two are virtually identical in appearance. Trinity considered legal action but the matter was not pursued. In addition to on-campus facilities, Trinity has a major book depository in Santry, from which books are retrieved on request. 53rd overall globally and 13th in Europe, up from 78th globally in 2006, 37th for Arts and Humanities globally (up from 39th in 2006), and the only Irish University in the top 100 (there are 4 in the top 300). 70th globally, 1st in Ireland and 10th for international mobility of graduates and value for money (globally). 201-300 globally and 1st in Ireland. Would it be fair to say that half of the Trinity College Dublin are international mediocre students, primarily from USA, Italy & Spain who do not get admission anywhere else?